Well, this is the second time I've missed the boat (so to speak) in this same fashion within the past year... First time was a very nice Shibuichi tanto sized tsuba that a fellow member had shown to me. By the time I saved enough cash for purchase, it was sold the day prior. 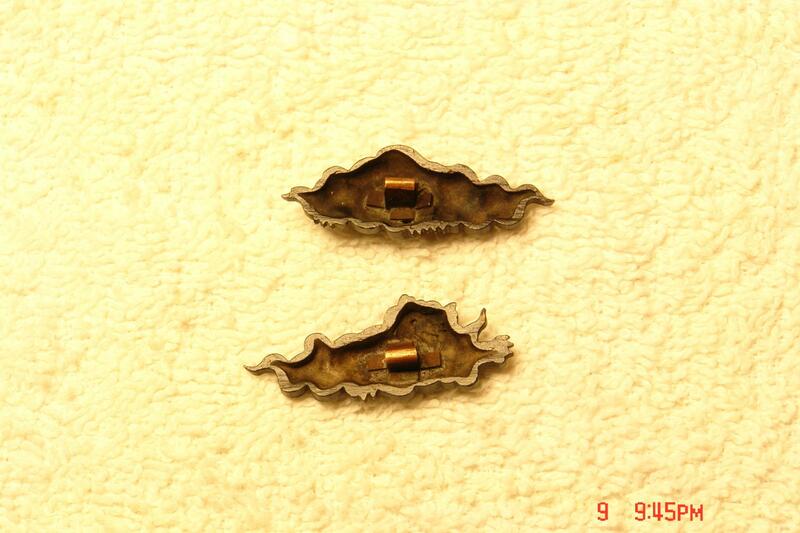 Now, today, I go to my eBay watch list to make an offer on a pair of papered Menuki. They are different and maybe not everyone's cup of tea, but for some reason they stood out to me and caught my attention. What say everyone? Horribly ugly? Or uniquely beautiful? P.S. If I may ask, if the person who purchased these is a member here, feel free to contact me and I'll make you an offer you can't(but probably will) refuse. But in all seriousness, nice purchase my friend. 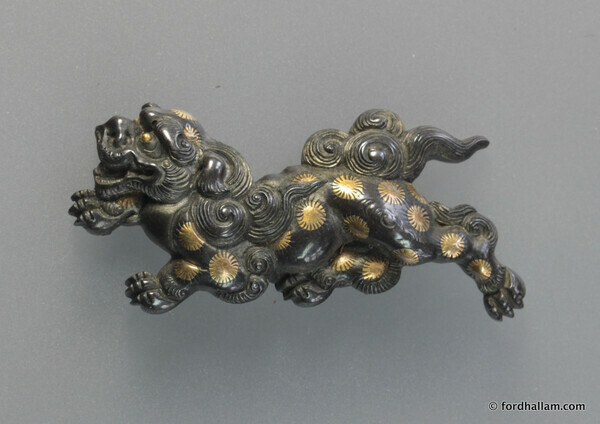 Very nice menuki. Too bad you missed them. I have words of wisdom from a departed good friend for you, "You snooze you lose". They appear to be high quality pieces, but i have a real problem with spotting the faces, i think this design isn't really my cup of tea. The workmanship appears to be excellent though. Fancy looking, otherwise not impressed. Yeah now that you guys mention it, I think I am more impressed by the detail and work than the color combo. I can't quite make out what the papers say but to me these purport to be Yokoya school work. Having said that they don't look right to me. The first thing about them is the gold discs. On genuine work these are neat inlaid circles, here they're pretty poorly shaped which suggest to me they've been electroplated on. The circle having been outlined with some paint on resist before actual plating. And then the actual lack of real crispness in the detailing, especially the swirls in the tails, these are usually directly chiselled but here seem to have lost their sharp ridges. I'm still clueless compared to most people here, but if there was no photo showing the pieces backside, hard pass. I have noticed a lot of of this odd looking material about, on certain sites it seems to make up much of what is presented. It looks to me like tired pieces that have been refreshed at minimal expense to catch the eye....both gilding and patina look fresh. This would be the 'restorers' version of the $99 automobile paint job. As Ford notes, the ill formed random circles/spots are very odd. 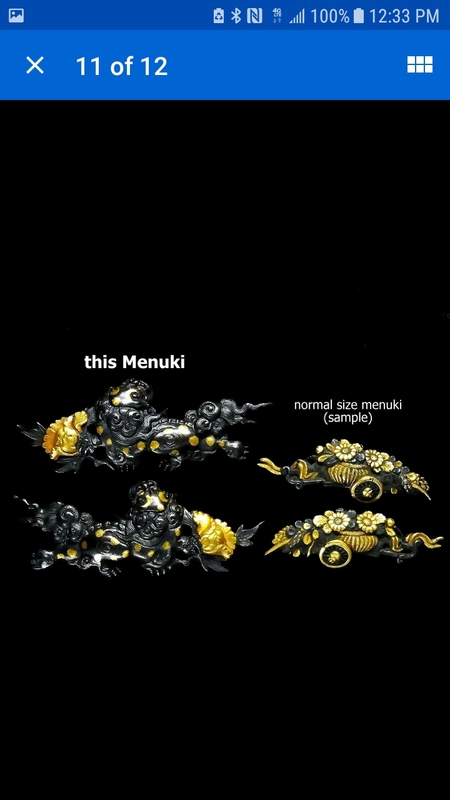 After reading the comments on the menuki and more closely examining the pictures I agree that they appear to have been refinished. I have a pair which seem to be from the same school (which ever it may be)that have been in my possession for about 40 years. Well before there were internet sales and doctored pieces.They have no perceptible wear and the dots of gold in the center of the floral patterns do not completely cover them (unlike the set under discussion). I believe the gold spots on mine were done using a gold/mercury amalgam. I don't know the Japanese name for the technique but have seen it many times. I have attached a couple pics of mine for comparison. Please excuse the image quality. I like the facial expressions. I don't. The upper one looks too much like me when my wife returns from what was supposed to be window shopping. I believe the gold spots on mine were done using a gold/mercury amalgam. 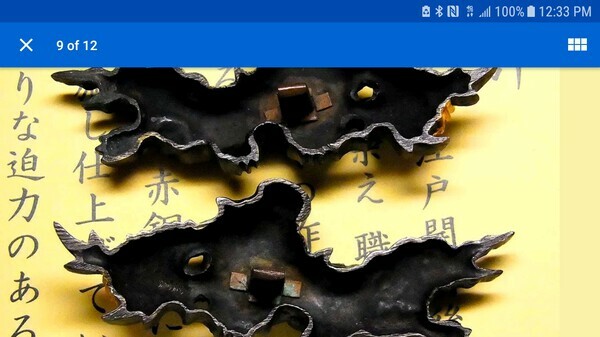 I don't know the Japanese name for the technique but have seen it many times. Second set much better quality than first, imo. 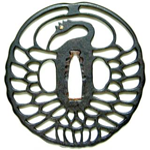 Your pieces are very nice examples in excellent original condition. They do appear to be mercury gilt, the very best of these have the discs inlaid with sheet gold. Personally I find the face a bit strange, it's quite distinctive and could be a way of identifying the maker. I don't think you've missed out on much. It looks to me like a poor restoration job on a sub-optimal postural design from an otherwise great school. 'Miss' a few more like these and you can go for the real thing, which will undoubtedly be a better investment. 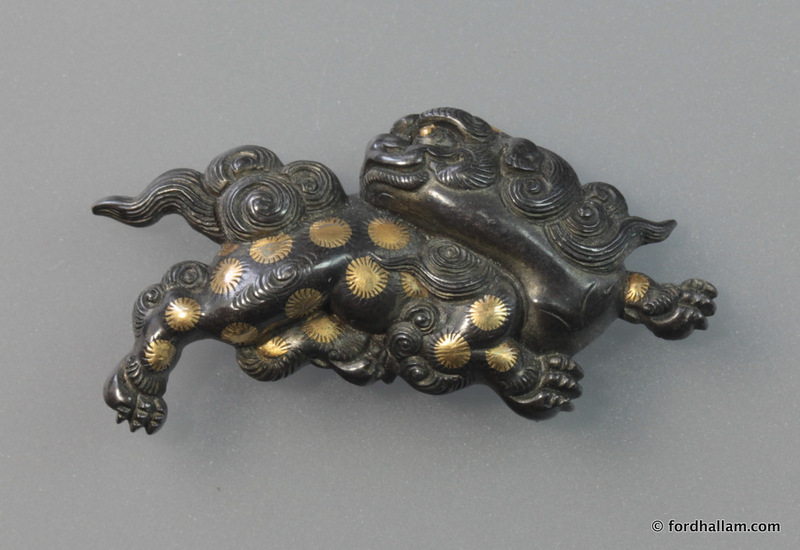 Note the crisp engraving of the tails and the sharp outline of the inlaid gold spots. Also, the expressiveness of the faces. Base metal is shibuichi, which is really stiff under the hammer and punch, and probably why we see relatively few menuki in this alloy. 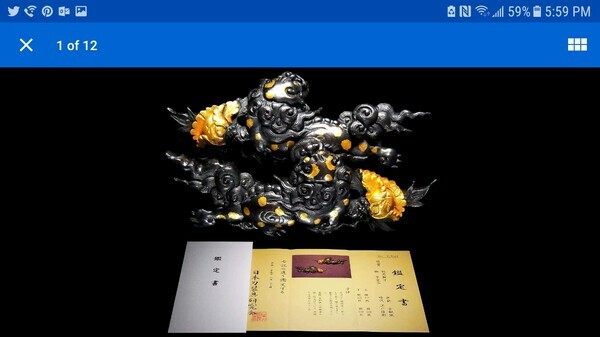 Great reference image, perfect example of the 'classic' Yanagawa style 'spots'! 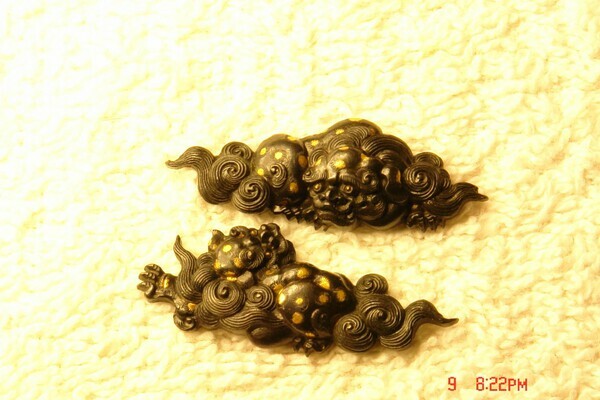 The more I look at them, and compared to the ShiShi posted above, these do look as if they were lacquered or "painted". 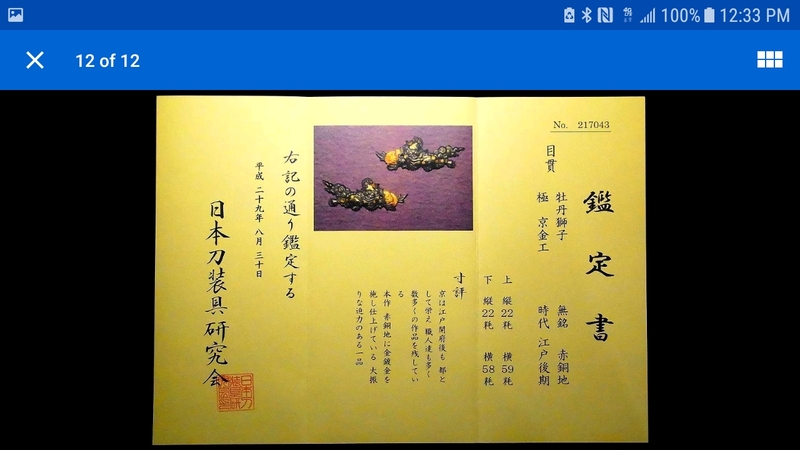 The gold circles are actually those circle "lines" that are usually on Yokoya. These look to be painted with maybe the gold combo stated above or something else. 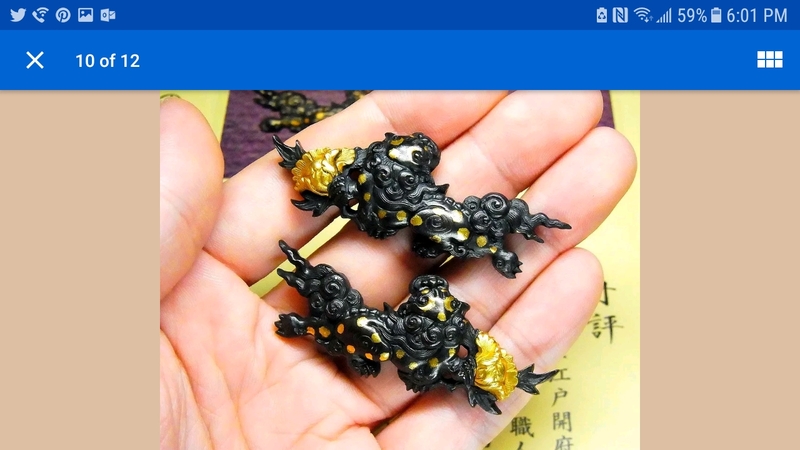 They're pretty vivid tho and the gold really pops but I think these Menuki would have been hard to fit with a koshirae combo (not to mention the size). Well they're papered so I guess these are basically destined to be collectors pieces to show off at parties and cherish forever until passed to next caretaker. Not too bad imho. Not the worst I've seen that's for sure.